Stunt Kites - Delta, Diamond, Parafoil or Quad? Delta, Diamond, Parafoil or Quad? Strictly speaking, stunt kites have been around since 1941, when a steerable diamond design was first flown. However, they started to become more well known and available to the public in the early 70s and onwards. The photo shows a couple of highly maneuverable 4-line or 'quad' kites being flown by a display team. You can tell by the tails that a moment ago the kites were barreling along in opposite directions! Most modern 2-line stunters are durable, fast and capable of tracing out precise patterns in the air. See below! In smooth winds, even a child can have some fun trying to keep the kite off the ground. With much extra practice comes the ability to do predetermined figures. Many different types of aerial stunters have been designed, put together and flown, but there are 4 main groups. Single stringers will never go out of fashion though. They definitely have their own attractions and their own uses. So many designs are available now, just go to a kite festival and see! Some can fly really high, others are incredibly complex and ingenious and yet others are breath-taking works of art. ... are inspired by the very earliest of hang-glider designs, like the Standard Rogallo. Just like the big man-carrying kite, a typical Delta stunt kite has a main spar and 2 leading edge spars with fabric stretched between them. 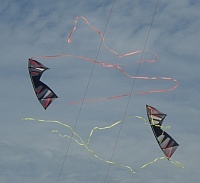 One, two or even three horizontal spreaders are also used to keep the kite's shape. The shape is vaguely triangular, with some designs looking more bird-like with swept wings. The 2 lines allow the Delta to be steered left and right when up in the air. 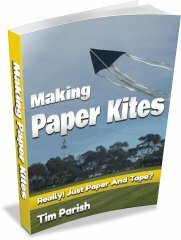 That means, with practice and a bit of skill, you can make the kite fly just about any pattern you like. 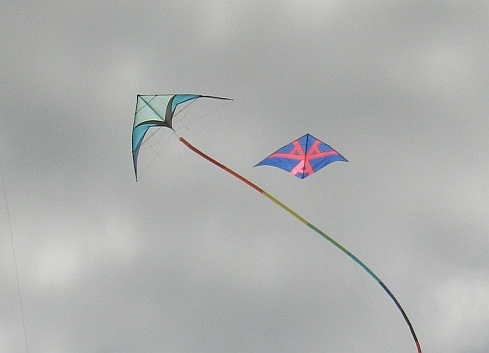 The more serious fliers like to use Spectra line for controlling these kites, due to the material's low stretch and high strength. In precision flying contests, many of the 'figures' consist of straight lines joined by sharp turns at the corners. ... are very similar to the Deltas in how they are steered. They look like the traditional kid's diamond kite that used to be made from a couple of sticks and any sort of paper that came to hand. 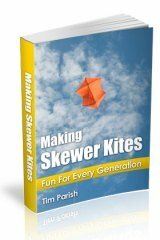 Can you relate to that kind of kite flying? 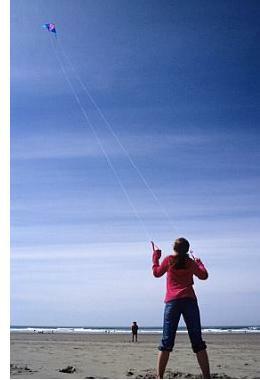 I can remember having a lot of fun as a kid, making terribly heavy and inefficient diamond kites! But it was fun. Plus some string and bits of cloth for the tail. Yes, most diamonds need a tail for a bit of stability. Some are designed to fly without a tail. 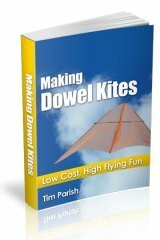 A famous early steerable Diamond was the Peter Powell Stunt Kite. These came with a super-long inflatable tail for extra spectacle. You can read some very interesting stories from the man himself in my interview with Peter Powell. And his sons, who re-launched the brand in 2014! We later wrote up our experience of unpacking, rigging and flying a new PP MkIII. 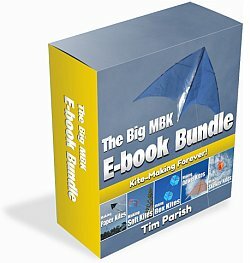 This review is a useful read if you are considering getting one. In addition, you can have a browse through these archived blog posts in which we flew the PP MkIII. 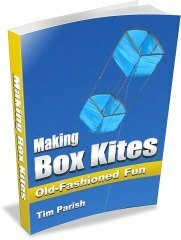 Finally, check out this U.K. perspective by an experienced kite flier who was right there during the PP Kite craze of the 70's! 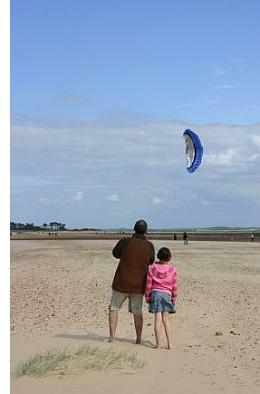 ... are a development of the original parafoil kite which was invented in the early 60s. Unlike most kites which have single surface sails, the parafoil has an upper and a lower surface. That original parafoil was also the inspiration for full-size man-carrying paragliders. How's that for an influential idea! Like paragliders, dual line parafoils keep their shape by the air ramming into the holes along the front edge. After the wind inflates the soft stunter for take-off, it stays pressurized during flight, holding its thick wing shape. ... look a bit like 2 kites joined side to side. They have an extra 2 lines which allow a whole new range of maneuvers. Tricks like 'axis spins' and 'hover' become possible with a bit of practice. And no, you don't need 4 arms to fly one, since there are 2 lines attached to each of 2 handles! As well as steering the kite left and right, you can alter how 'nose-high' the kite sits in the air as well. It's like being able to adjust the bridle while the kite is still in the air! If stunt kites are the aerobatic planes of kite flying, these quads could be called the aerobatic helicopters! So much can be done with these kinds of kites, and so many people are having fun flying them. More officially they are called sport kites. Down at the beach is a popular place to fly, with the wide open spaces and smooth breezes. 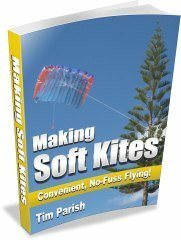 Are you are thinking about buying a cheap stunt kite for the first time, just to give it a try? If so, we have written up our first sport kite experience like a review. You might find it a semi-interesting read! That page turned out to be a one-off, for quite a while, until we received the PP MKIII. Kite flying used to be a very laid-back, relaxing thing to do. Even a bit boring for some. But these days it's not unusual to hear words like 'addicting' or 'adrenaline rush' when talking about flying stunt kites! My short history of stunters will interest you if you are after more detail in that direction. Doing kite stunts, perfecting them and learning new ones can be a lot of fun for anyone who owns stunt kites. It takes care of that urge to fly something! Like an aerobatics display at an air show, it's also fun to just watch others fly. Curious as to what shapes or figures can actually be done with a stunt kite? Well, if it's your kite you can do anything you like of course. Carve any interesting shape in the air and then try to do it again, exactly the same. Will anyone ever get around to compiling a monster list containing every stunt in every list that's been published on the web, or in a book? I doubt it, but personally I think it would be fun to learn just a few basic figures then make up a whole lot more original ones! Maybe publish your own list one day. Not surprisingly, over the years some keen people have organized kite flying competitions and displays. At various public events you can see one person, a pair or even an 8-member team put on a dazzling display of fast, precision kite flying. Kite festivals are a sure place to see something like this. During his lifetime, Ray Bethell, the 'Multi-Kite World Champion', was extremely well known for his mesmerizing sport-kite performances at major kite festivals around the world. He held numerous sport kite records and titles. Ray flew 3 steerable kites, or even 3 stacks of kites, simultaneously. Ray also produced 2 short movies which showcased his amazing flying skills: 'Good Stuff' and 'Romancing the Wind'. Much like an aerobatics competition for model planes or the real thing, kite competitions involve flying a standard set of figures. As well, there is sometimes a section where the flyer can exercise a bit of creativity in time with music. A kite ballet! Ballet? That's the official term that's crept in, but not everyone likes it! 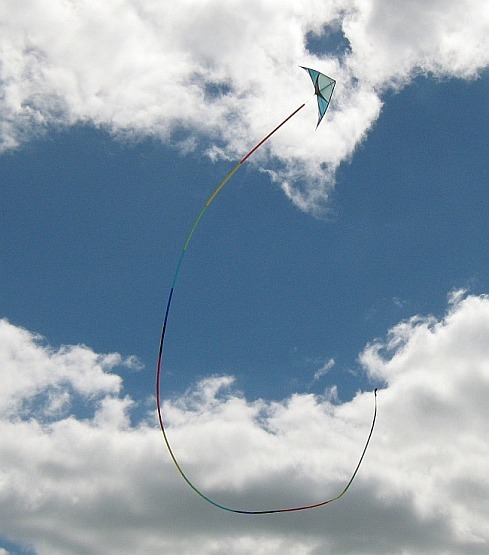 In the photo, a Delta stunt kite circles around, with a single-line Delta in the background. To sum up where stunt kite design is today, let's just say all the basic types are still around. Deltas, Diamonds, Parafoils and Quads. 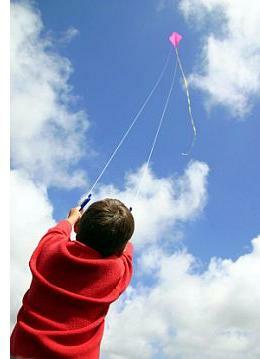 Kite spars, once mainly fiberglass from the fishing equipment manufacturers, have become lighter, stronger and stiffer. These days fiberglass and carbon fiber are reserved for the less expensive kites for beginners. Wrapped graphite, titanium and niobium lightweight metal are the materials of choice for the more expensive high-performance kites. Tapered wrapped graphite was the very latest thing in early 2008. Kite sails were once made from spinnaker nylon, handy for its tear-resistant rip-stop construction. These days, even lighter grades of rip-stop nylon are used. As well, there are newer kite sail materials called CarringtonTM and NouveauTM. Lines of cotton, nylon or Dacron are still used for most single-line kites, since it's cheap and stretch doesn't matter much. These materials are still usable for today's multi-line sport kites. However, Kevlar with its low stretch makes for better control with a more positive feel. The ultimate material for strength and low stretch is Spectra, which is popular with the real experts. 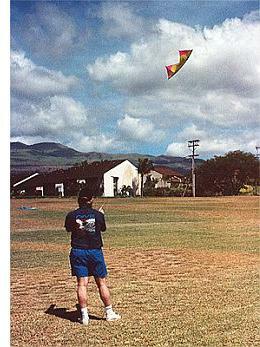 The trick kite is a particular kind of Delta stunter which has become popular. This opens up a whole different kind of stunt flying, which has less emphasis on flying large shapes in the air. Instead, the kite is made to flip, spin, stall, land and do other 'tricks' both on and off the ground. Just take a look at the video, if you follow that link up there.